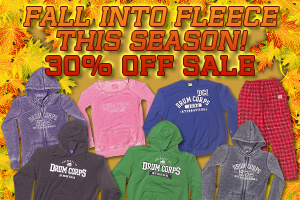 Fall is in the air, and for a limited time only, you can take 30 percent off all fleece from the Drum Corps International online store. Choose from a wide variety of hoodies, sweatshirts, pants and other items in both men's and women's styles in many different colors starting as low as just $17. This 30% off promotion runs for a limited time only. Order before Monday, Oct. 15 to take advantage of sale prices. Certain restrictions may apply. Offer expires Monday, October 15, 2012 at midnight (12 a.m.) ET. Offer cannot be combined with other promotions or discounts. Drum Corps International reserves the right to modify or cancel promotion at any time.